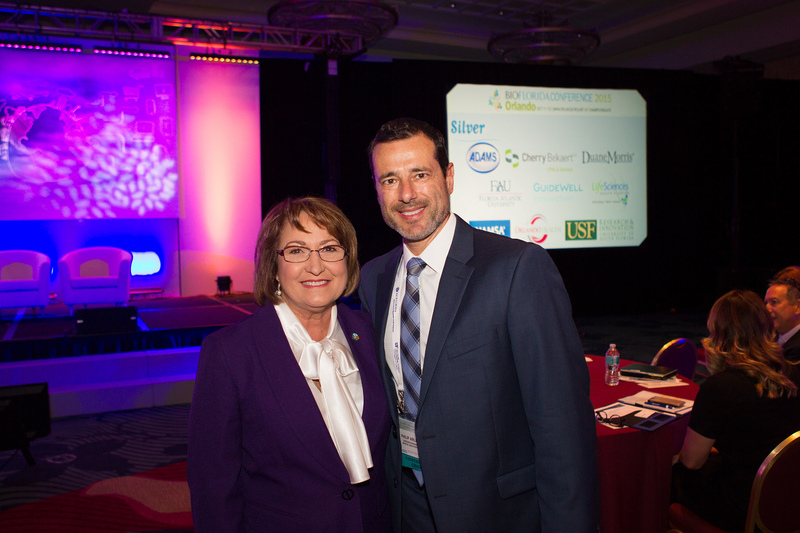 Mayor Teresa Jacobs joined community leaders at BioFlorida’s 18th Annual Life Sciences Conference, which highlights the growth, successes and transformations of Florida’s thriving biotechnology and life science sectors in Central Florida. The conference was held at the Omni Orlando Resort at ChampionsGate on Oct. 12 and featured Mayor Jacobs as a guest speaker. BioFlorida is the voice of Florida’s life sciences industry, representing nearly 5,500 establishments and research organizations in the biotechnology, pharmaceuticals, medical devices, diagnostics and bioagriculture sectors, which collectively employ nearly 80,000 Floridians. This year’s program included keynotes and general sessions focused on topics ranging from connecting innovators and businesses on a global level to further advancing Florida’s life sciences community. Mayor Jacobs spoke about the world-renowned Medical City in Lake Nona, a 650-acre, health and life-science park anchored in east Orange County. The region’s Medical City is home to some of the nation’s top hospitals, universities, research institutions and health and life-science companies, including the University of Central Florida Health Sciences Campus, Sanford Burnham Prebys Medical Discovery Institute (formerly Sanford-Burnham Medical Research Institute), Nemours Children’s Hospital, the University of Florida Academic & Research Center, as well as the new Orlando Veterans Administration (VA) Medical Center and Veterans Health Administration (VHA) Simulation Learning, Education and Research Network (SimLEARN) National Simulation Center. The 52,000-square-foot center will serve as a high-tech advanced training facility for VA medical centers across the nation. President and CEO of BioFlorida Nancy K. Bryan said holding the BioFlorida conference in Central Florida brings the industry together to share successes and best practices. “The 2015 BioFlorida Conference delivers the insights, collaborative atmosphere and relevant programming that is necessary to grow the industry,” Bryan said. Representatives from companies, institutions, communities and the state legislature participated in the expanded programming highlighting Florida’s areas of strengths in various medical technologies, pharmacology, medical advances in injuries and research. Photos from the BioFlorida conference may be found on Flickr for use by the media.